J.T. 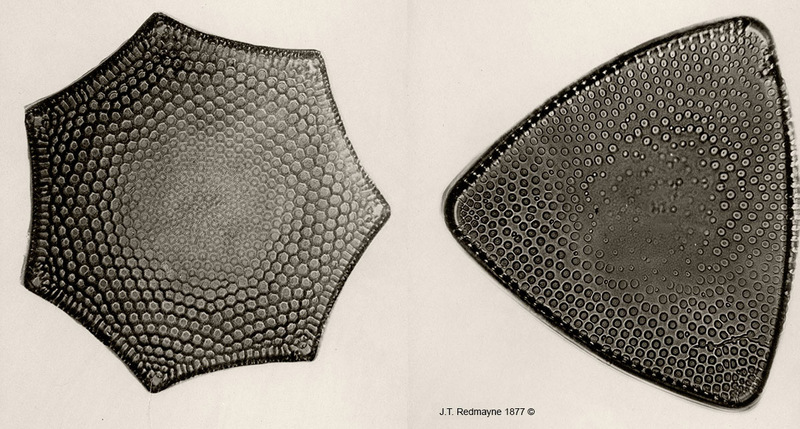 Redmayne was a surgeon and physician, and an amateur naturalist specializing in diatoms. 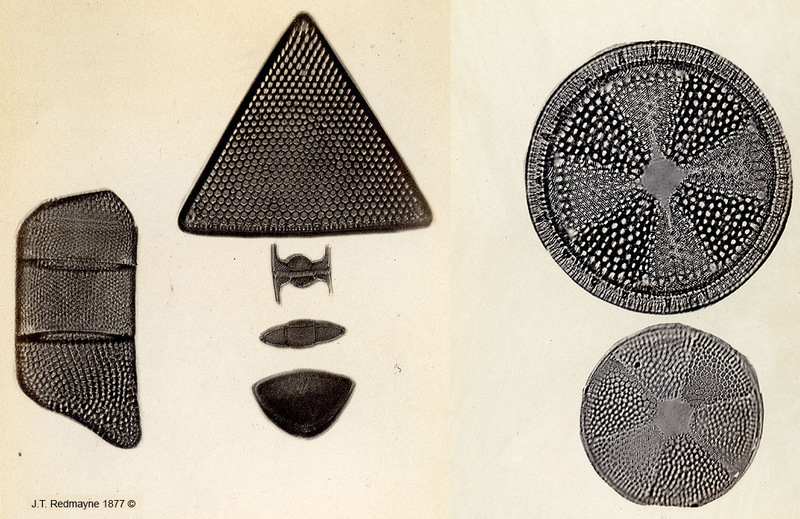 His microscope slides of diatoms were very well regarded in his time, notably for their relative purity of species (Figure 1 and 2). He also mounted histological preparations, a logical extension of his occupation, although such slides are rarely encountered today. Figure 1. 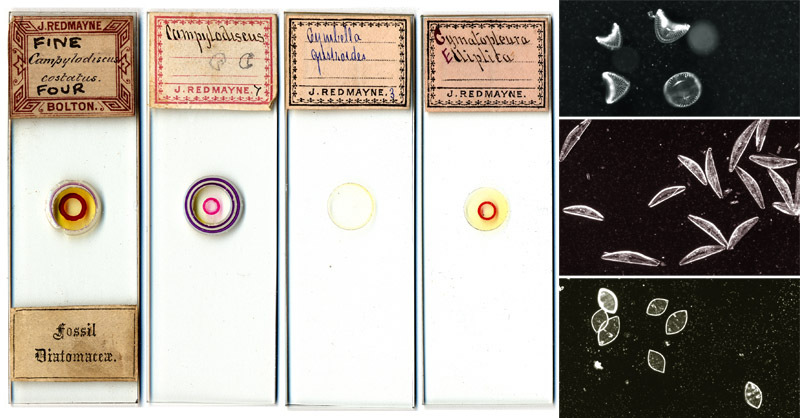 Examples of selected diatom slides by J. Redmayne. They contain from four to a few dozen selected frustules, loosely arrayed in the center of the slide. 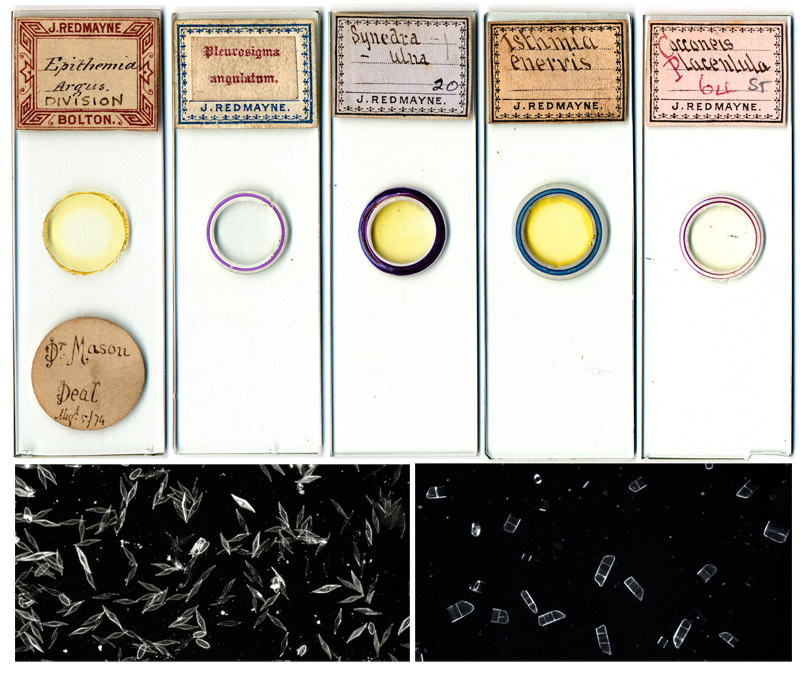 Although the diatoms were not artistically arranged like those of contemporaries such as Laurence Hardman, Redmayne’s mounts give views of the diatoms from multiple angles, highly desirable for biologists interested in diatom structure. At the right, top to bottom, are darkfield images of Redmayne’s Campylodiscus cestatus, Cymbella sp., and Cymatopleura elliptica. Photographed with colored filters. Note that Redmayne used a variety of handwriting styles on his labels. Figure 2. Strewn diatom slides by John Redmayne, each of which contains hundreds of diatoms spread evenly under the coverslip. Shown below the slides are, left to right, a gathering of Pleurosigma angulatum mixed with small numbers of other species, and a pure gathering of Isthmia enervis. John Thomas Redmayne was born during the first quarter of 1846 near Horton, Yorkshire. He was the first child of William and Isabella Redmayne. William operated a 120 acre farm named “Gallabar”. There is some confusion among genealogies posted on the internet, with some family trees suggesting that our J.T. Redmayne’s parents were another farming couple named John and Margaret. However, the 1878 marriage record of the John Thomas Redmayne born to John and Margaret indicates that he was not our microscopist. Such confusions are common in genealogical research, as families tended to recycle a very few ancestral names. By 1861, the Redmaynes had moved to Clitheroe, Lancashire, where William operated a wine shop. Such businesses were usually profitable, and probably helped finance John’s medical education. In September, 1864, John Redmayne passed his preliminary examinations at the Faculty of Physicians and Surgeons, Glasgow. He continued his studies at Guy’s Hospital, London, receiving his diploma and admittance to the Royal College of Surgeons in January, 1869. John married Sarah Fielden Hyatt during the summer of 1870. They set up house in Bolton, Lancashire shortly thereafter. Apparently, Redmayne took additional classes in Edinburgh around that time, as he reported having received a License in 1873 from the Royal College of Physicians, Edinburgh. 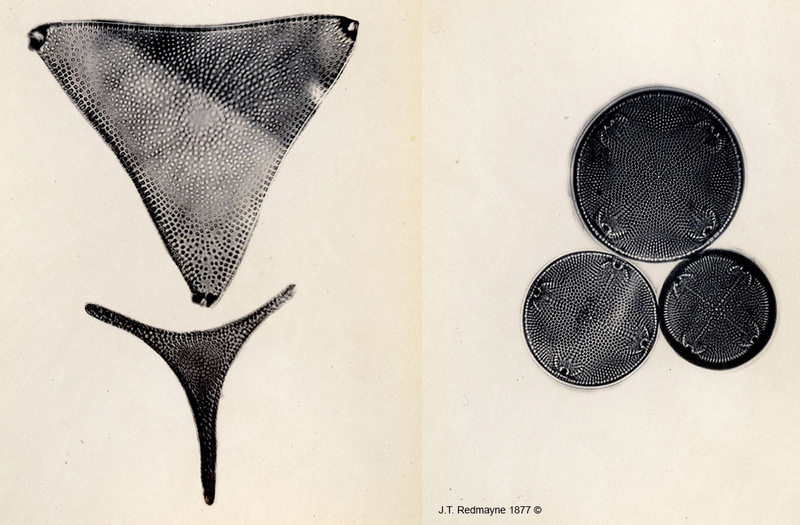 Redmayne evidently developed an interest in diatoms and making slides prior to 1874. In August of that year, he advertised in the popular magazine Hardwicke’s Science-Gossip to exchange “good slides” of diatoms with other microscopists (Figure 3). The following year he offered to exchange “pure gatherings prepared” of diatoms. Figure 3. Exchange offers advertised by John Redmayne in ‘Hardwicke’s Science-Gossip’. Redmayne described a device he invented for the collection of diatoms, in the July, 1875 issue of Hardwicke’s Science-Gossip. This invention was widely reprinted throughout the world. “As the beauty of mounted diatoms depends in a great measure on the cleanliness of the original gathering, sand and other impurities being difficult to get rid of in after-manipulation, I have found the following addition to the ordinary collecting apparatus, of very great assistance. It has the advantage of being easily made, and with its aid much better results can be obtained than by any other means. A cork must be provided which fits tightly to the collecting-bottle; this is to be bored with two holes; in each is fitted a glass tube, as seen in the diagram, one (a) having a slight curve, the other (b) bent at right angles an inch from the end; this can easily be done with the aid of a spirit-lamp. To tube b is attached a piece of elastic tubing, about the length of the collecting-stick, and the free end (c) may be held to the stick with an elastic band, and the apparatus is complete. It is especially useful in collecting the very thin films of diatoms from the surfaces of mud and sand, so difficult to raise to the surface of the water in the ordinary way with the spoon or bottle. To use the apparatus, the thumb of the right hand must press the tube firmly against the stick at c, and the bottle lowered until the mouth of the tube (a) is within a quarter of an inch from the surface of the diatoms; the thumb is then to be raised, and if the water is deep, the bottle will fill by atmospheric pressure, carrying the diatoms in at the same time. In shallow water suction will be necessary to exhaust the air in the bottle: in that case a ball pipette (fig. B) will be useful as a mouthpiece. Figure 4. 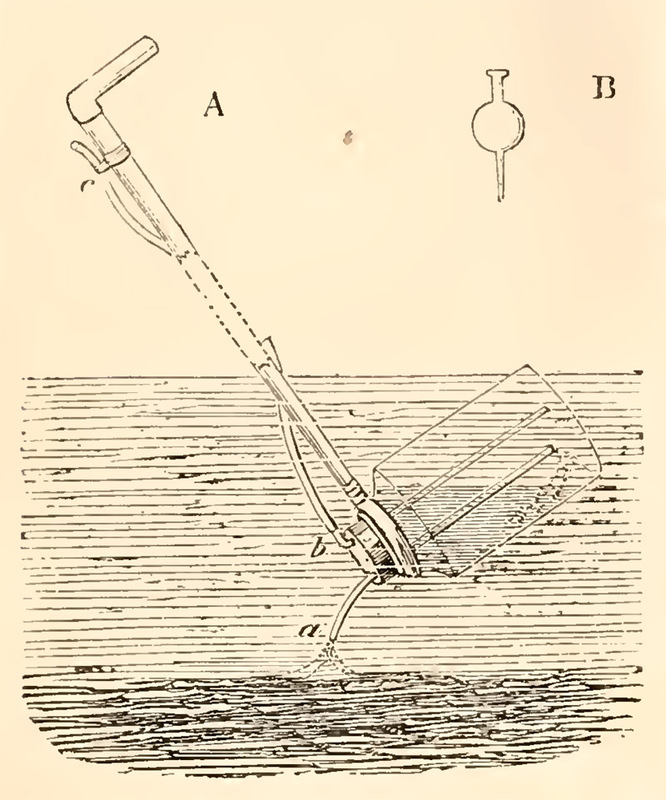 Redmayne’s diatom collecting device. From ‘Hardwicke’s Science-Gossip’, 1876. Figure 5. Front page, table of contents, and technical details from Redmayne’s 1877 book of diatom photomicrographs. Adapted with permission from http://www.canadiannaturephotographer.com/Redmayne_diatoms.html. Figure 6. Plate 50, Pleurosigma angulatum, magnified 750x, by John Redmayne. 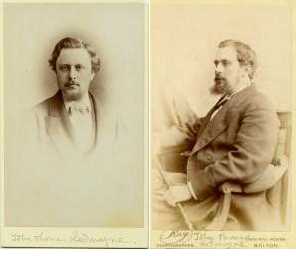 Additional photographs from his 1877 book are reproduced in Figures 8-11, at the end of this essay, and at http://www.canadiannaturephotographer.com/Redmayne_diatoms.html. Image adapted with permission of Robert Berdan. Redmayne donated copies of his book to the Quekett Microscopical Club (which he joined in 1876) and the Royal Microscopical Society (which he joined in 1877). Redmayne also helped found the Bolton Microscopical Society, in 1877. John Thomas Redmayne died after a long illness on September 10, 1880, at the age of only 34. One of the executors of his estate, John Francis Walkingame Tatham, was later a President of the Manchester Microscopical Society. Intriguingly, although the Redmaynes were Quakers (Society of Friends), Sarah Redmayne was baptized in the Anglican church of All Souls, Bolton, on February 25, 1880. Figure 7. Undated photographs of John Thomas Redmayne. Adapted for non-profit, educational use from http://family.manvell.org.uk/redmayne.htm. Figure 8. Left: Plate 55, Actinosphenia halionyx, and Actionsphenia spendens, 500x. Right: Plate 78, Heliopelta and Actinoptychus undulatus, 500x. Adapted with permission, from http://www.canadiannaturephotographer.com/Redmayne_diatoms.html. Figure 9. Left: Plate 58, Triceratum favus var spetanghulatum, 500x. Right: Plate 59, Triceratum inflatum, 500x. Adapted with permission, from http://www.canadiannaturephotographer.com/Redmayne_diatoms.html. Figure 10. Plate 31, Cymbella gastroides, 500x. Adapted with permission, from http://www.canadiannaturephotographer.com/Redmayne_diatoms.html. Figure 11. Left: Plate 63, Trinacria regina and Trinacria excavata, 500x. Right: Plate 64, Hemialus alatus and Actinocyclus ralfsii, 500x. Adapted with permission, from http://www.canadiannaturephotographer.com/Redmayne_diatoms.html. Thank you to Robert Berdan, for sharing images of John Redmayne’s book of diatom photographs, and for generously providing permission to use some in this page. The American Naturalist (1876) Collecting diatoms, Vol. 10, page 567. Berdan, Robert (accessed 2017) Photomicrographs of Diatoms from 1877 by John T. Redmayne, http://www.canadiannaturephotographer.com/Redmayne_diatoms.html. Bracegirdle, Brian (1998) Microscopical Mounts and Mounters, Quekett Microscopical Society, London, pages 79, 164 and 166, plate 30 slide N and plate 31 slides C and D.
Davis, George E. (1881) Photo-micrography, Northern Microscopist, Vol. 1, pages 73-82. Davis, George E. (1889) Practical Microscopy, W.H. Allen & Co., London, pages 184 and 384. English census, birth, marriage and death records, accessed through ancestry.co.uk. Hardwicke’s Science-Gossip (1874) Exchange offer from J. Redmayne, Vol. 10, page 192. Hardwicke’s Science-Gossip (1875) Exchange offer from J. Redmayne, Vol. 11, page 240. Hardwicke’s Science-Gossip (1878) Exchange offer from J. Redmayne, Vol. 14, page 168.
http://family.manvell.org.uk/redmayne.htm (accessed December, 2012) Photographs of John Redmayne and family. Johnson, G.J. (1883) Photomicrography, The Microscopical News and Northern Microscopist, Vol. 3, pages 113-121. Journal of the Quekett Microscopical Club (1876) Admittance of John T. Redmayne, Vol. 4, page 201. Journal of the Quekett Microscopical Club (1876) Donation of “An album of Micro-Photographs of Diatomaceae” by Mr. J. Redmayne, Vol. 4, page 240. Journal of the Royal Microscopical Society (1877) Membership list, Vol. 2, page liv. Journal of the Royal Microscopical Society (1881) President’s Address, Series 2, Vol. 1, pages 180-181. The Lancet (1864) Faculty of Physicians and Surgeons of Glasgow, Preliminary Examinations, Vol. 2, October 15 Advertiser section. Marriage record of one John Redmayne and Anne Barrett (1878) Information concluding that diatomist J.T. Redmayne was not the child of John and Margaret Redmayne, Parish records of Kirkby Overblow, accessed through ancestry.co.uk. The Medical Press and Circular (1867) Royal College of Surgeons of England – results of examinations, May 22, pages 497-498. The Medical Press and Circular (1869) Royal College of Surgeons of England – diplomas and new members, January 27, page 75. The Medical Register (1874) Redmayne John Thomas, Astley bank, Bolton, Lancashire, Mem. R. Coll. Surg. Eng. 1869, Lic. R. Coll. Phys. Edin. 1873, page 422. The Medical Times and Gazette (1867) Royal College of Surgeons of England – results of examinations, Vol. 1, pages 538-539. The Monthly Microscopical Journal (1877) Donation to the Royal Microscopical Society of “Micro-photographs from the Diatomaceae, By J. Redmayne”, Vol. 17, page 222. The Northern Microscopist (1881) Notices of Meetings – Bolton Microscopical Society, Vol. 1, pages 12-13. The Northern Microscopist (1881) Bolton Microscopical Society, Vol. 1, page 167. Probate record of the Will of John Thomas Redmayne (1880) accessed through ancestry.co.uk. Redmayne, John (1875) Diatom collecting, Hardwicke’s Science-Gossip, Vol. 11, page 152. Redmayne, John (1877) Micro-photographs from the diatomaceae, Redmayne, Bolton. Taylor, John E. (1889) The Playtime Naturalist, Appleton & Co., New York, pages 258-261.